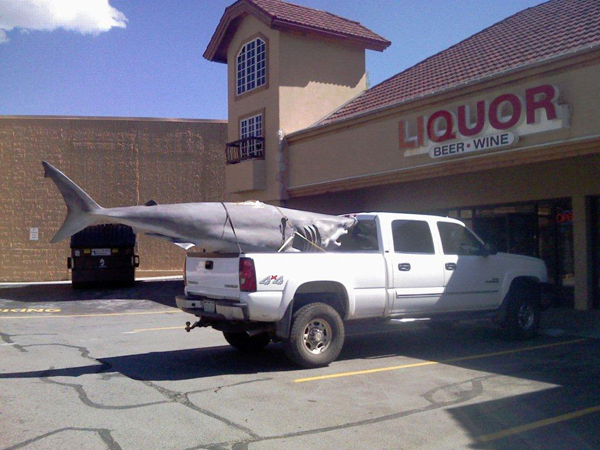 Special to the Daily/Brian LecklitnerHaven't you always wanted to pull up in front of a liquor store in a pickup with a giant stuffed shark in the back? Lord knows we have, and this guy was living the dream recently in Silverthorne. Thanks to alert reader Brian Lecklitner for sending this in. One can only hope an old Journey song was blasting from the truck's stereo. Good morning and welcome to Summit Up, the world’s only daily column that can’t stop wondering what this shark-in-the-pickup-truck thing is all about. According to guy who sent us the photo, the shark came from a bar in Colorado Springs and was on its way to Blue River. But why? Where, exactly? Who would have room for something like this in their living room? Is it a real, stuffed shark or a fake made of plastic? Is it rough to the touch or smooth? Does it smell funny? Does it have some kind of rings already screwed into it for easy hanging, or would you have to figure that out yourself? It says something, too, to know that you can go from being the ocean’s top predator one day to being killed, stuffed and strapped into the bed of a pickup truck in front of a liquor store in Colorado the next. But that’s life, ain’t it? Damn. … check out Prost in Frisco, where they’ve got Spaten Oktoberfest on tap right now. We hear there’s not a lot of this particular brew in the state, and it’s just about the tastiest stuff we’ve had lo these many years. Prost is fast becoming a favorite of the Summit Up Central Staffers, and we predict before long they’ll be looking for a larger space. Right now it’s three tables, a tap with some yummy beers and a whole lotta oompa-style music cranking on the loudspeakers. We love it. OK folks, gotta go and rake leaves or something.